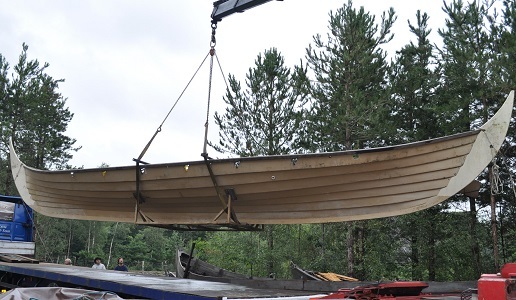 Next, our largest wooden replica in commission is The Bear, a 32′ (9-10m) generic period vessel in larch on oak. 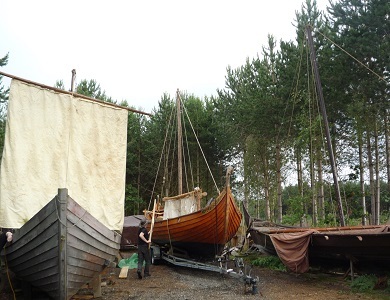 It is an impressive, workable ship replica and again, comes on its own especially-commissioned road trailer. It has appeared in Game of Thrones and Vikings, done promo work in the Pool of London and materially added to several other TV and film presentations. It can be slipped without difficulty and is in frequent use. Our largest wooden vessel is The Wolf, a fifty foot hull. It is not in commission, but film-makers may be interested in it as a prop or as the basis for conversion etc. Only half of this ship is accessible, as it is in the process of becoming a permanent boat burial exhibit. Therefore, we can offer a total of seven ship and boat replicas, probably the largest fleet of vessels of this kind in private hands in a thousand years! We recommend Rutland Water, about thirty miles due east of Leicester. It is the largest man made body of water in the UK and an excellent, workable location with an uncluttered range of angles that gives the impression of being at sea and various creeks and inlets where a raiding party might come ashore. From a practical point of view, the lake has its own power boats and safety crews, an excellent café where the staff are used to damp, cold people and serve big stews and other food. There is ample parking for the largest vehicles.